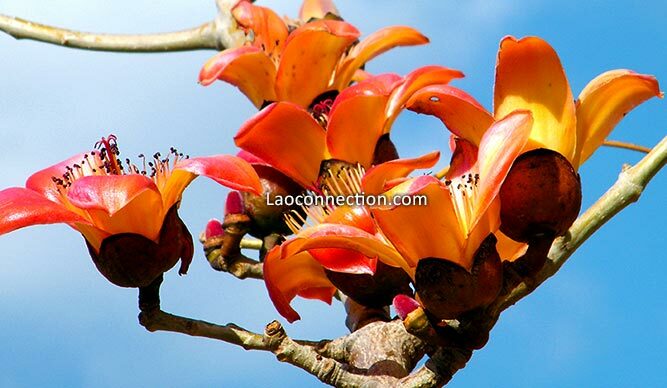 The festival celebrates the blossoming of the kapok trees, which are now in full bloom across many hectares of Don Xao Island, part of the Golden Triangle area. This is the 18th edition of the festival. This year, the organising committee has added to the usual range of activities, which include a market fair, an acrobatics show, food, beauty and sports contests, cultural performances, and an ethnic fashion show. The festival is a double celebration as provincial authorities are using the event to announce the start of Visit Laos Year, with the festival being a dramatic start to the year-long tourism drive. Present at the opening ceremony were National Assembly President Ms. Pany Yathotou, Deputy Prime Minister and Minister of Finance Somdy Duangdy, senior officials from around Laos, and thousands of visitors from Laos, Vietnam, China, Thailand and Myanmar. Speaking at the ceremony, Bokeo provincial Governor Dr Khamphanh Pheuyavong said the festival also shared the occasion with another great event – the 35th anniversary of the province’s founding, which all local people were delighted to celebrate. “We are holding the Kapok Flower Festival, celebrating the 10th anniversary of the Golden Triangle Special Economic Zone and also launching Visit Laos Year here on Don Xao island. This site is known as Dok Ngiew field and the people of Bokeo have welcomed the appearance of the kapok blossoms for many years,” he said. Director of the provincial Information, Culture and Tourism Department, Mr. Soukkha Lienthongkham, told Vientiane Times that more than 10,000 people come to the festival each year. This year the number of visitors from Laos and neighbouring countries is expected to double because of the launch of Visit Laos Year. 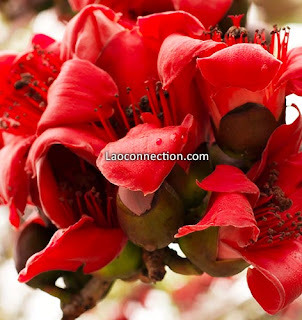 The Kapok Flower Festival is held in January or February every year, drawing thousands of people to admire the mass of colourful blossoms. This longstanding event is part of the traditions that give Bokeo and its people their special identity, Mr. Soukkha said. The festival bolsters tourism, encourages Lao people to travel within the country, and inspires more foreigners to invest in tourism in Bokeo province. The event features more than 300 stalls selling food, clothing, handicrafts and items made under the One District, One Product scheme as part of the market fair taking place from January 23-29. The fair generates revenue for local people and the economy, while giving tourists an insight into the culture and traditions of the 13 ethnic groups living in Bokeo province. Ladies from around the province took part in the beauty contest and there were also competitions showcasing sporting traditions, such as cycling and boxing, with participants coming from Laos, Thailand, China and Myanmar.